Regular readers will know that through clever use of credit card spending alongside airline frequent-flyer programmes I very rarely pay for flights. How is this possible I hear you ask? Read on within this Virgin Atlantic review to find out how you, too, can travel the world for free. 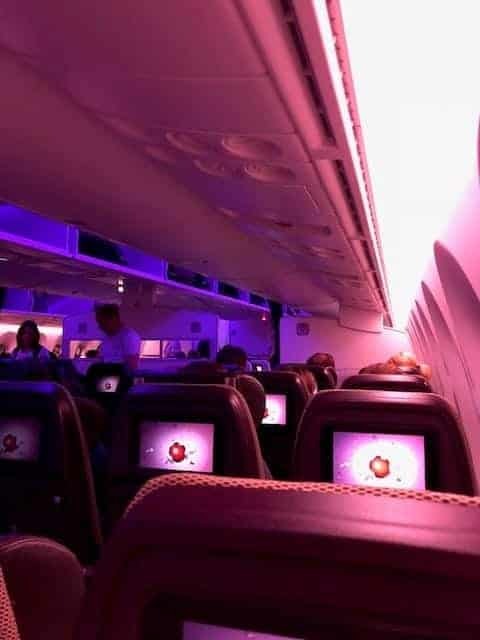 You’ll also get a glimpse of what to expect when flying Virgin Atlantic economy just as I did when I flew on a Virgin Atlantic aircraft from Johannesburg last week. Now there are two possible ways to book for your Virgin Airlines flight. First is the traditional method through the website found here. Secondly there is the more exciting option, leveraging your existing spending to fly for free using credit card rewards points. Virgin Atlantic Economy Light: Hand baggage only with seats assigned at check-in. These cannot be upgraded to Upper Class or Premium Economy with miles. Earns 25% of miles flown plus 25 tier points each-way. Virgin Atlantic Economy Classic: This is the classic economy fare with the ability to pre-select seats with checked-in luggage included. These can be upgraded to Upper Class or Premium Economy with miles. Earns 50% of miles flown plus 25 tier points each-way. 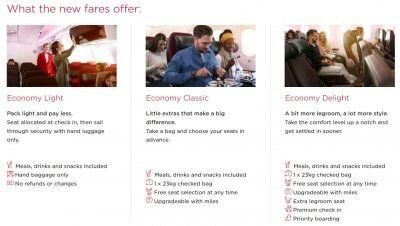 Virgin Atlantic Economy Delight: Extra legroom (34” pitch), free seat selection at any time, priority check-in and priority boarding, can be upgraded to Upper Class or Premium Economy with miles. Earns 150% of miles flown plus 50 tier points each-way. Take a look below to see how prices vary for the various Virgin Atlantic economy options. Full details on the Virgin Atlantic tier point system can be found here. As a brief summary you need 400 tier points in a rolling 12-month period for Silver and 1,000 tier points for Gold. Now let’s focus on the exciting part. 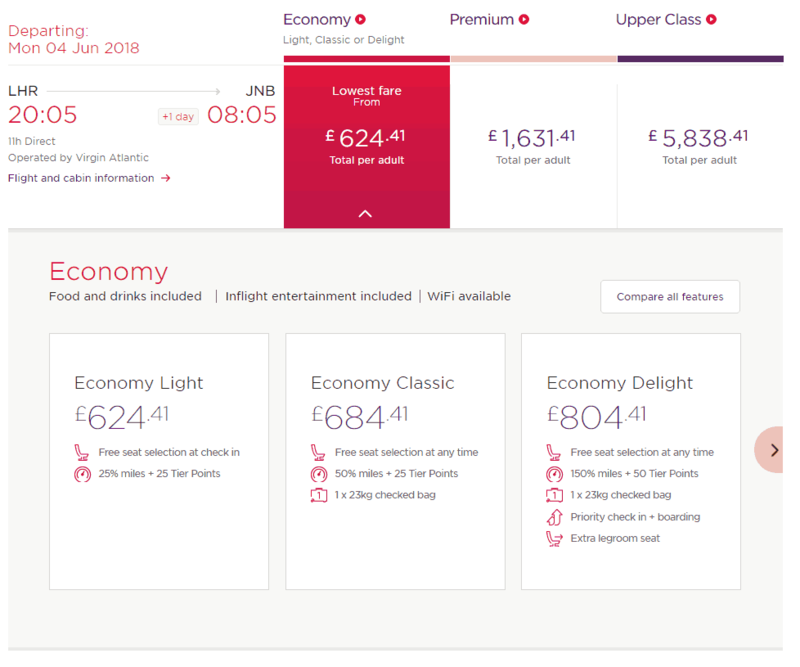 How can we use both Virgin Reward points and American Express Rewards points to obtain a Virgin Atlantic economy flight which would usually cost £684 return? 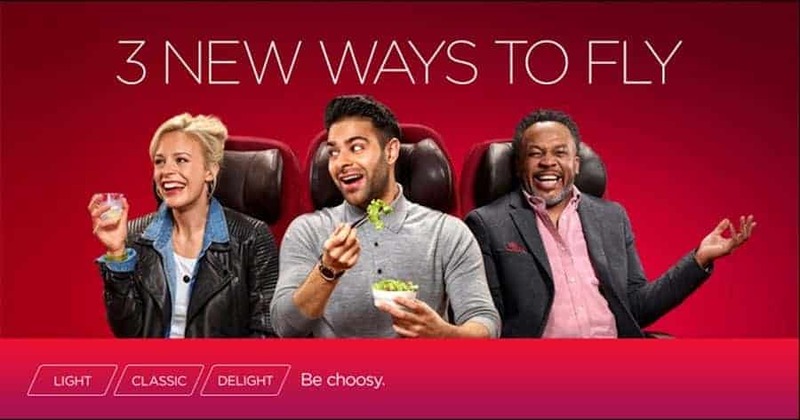 Virgin Atlantic credit card (reviewed here) – Recently launched, the new Virgin Atlantic card offers either 5,000 points upon signing up to the free card or alternatively 15,000 points for the premium card which comes with a price tag of £160 per annum. These cards also offer an excellent earning rate for a MasterCard of 0.75 miles per £1 on the free card and 1.5 miles per £1 on the premium card. What’s better is that the cards offer a 2-4-1 voucher when you spend £10,000 in a year. 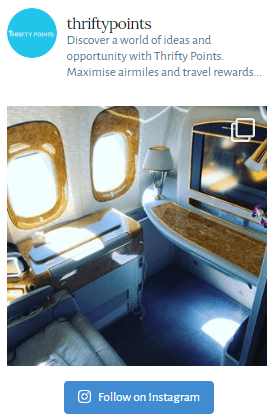 American Express Gold card – My most prized, free credit card for sign-up bonuses is the Amex Gold card which offers 20,000 Membership Rewards points when you spend £2,000 in the first 3 months (or 22,000 points if you use this link). These can be transferred directly to Virgin Atlantic Flying Club points at a rate of 1:1. See my full review here. With a total spend of £12,000 across both the free cards it would be possible to accumulate 12,500 points on the Virgin Atlantic card and a further 24,000 points on the American Express providing 36,500 Flying Club points. This combined with a 2-4-1 voucher would be enough for a round-trip flight for two people in Premium economy to the Caribbean, which would use 35,000 points. We used our points to fly Virgin Atlantic economy return to Johannesburg from London Heathrow. Whilst this Virgin Atlantic economy review will focus on the Johannesburg to Heathrow leg, I wanted to highlight a couple of excellent benefits to flying out of Heathrow Terminal 3. We arrived about two and a half hours before our flight and I was amazed at just how quiet the check-in desks were. 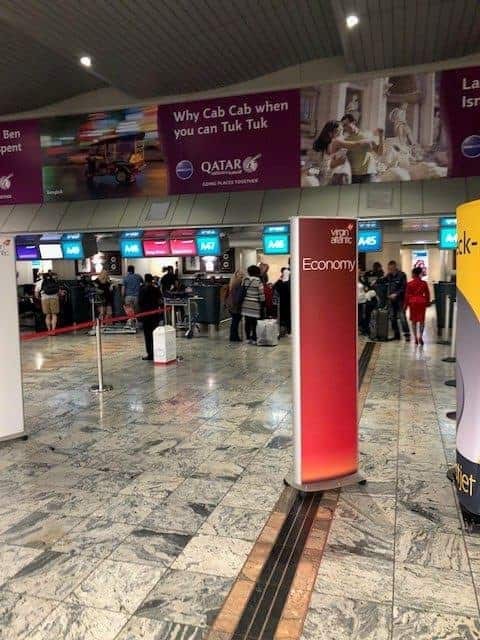 Johannesburg was a very similar story, with almost no one queuing at check-in. Virgin Atlantic luggage – Using Flying Club miles we were able to take 23kg, far too much for me although my other half did her best to use it up for the both of us. We arrived at our gate some 40 minutes before our flight was due to board. A queue had formed, however we were aware that buses would take us to the Virgin Atlantic aircraft (Boeing 787-9) so we decided to hold fire. There were two flights bound for Heathrow at a very similar time… Virgin Atlantic boarded perfectly on time with the British Airways flight some two hours delayed (good job we flew with Virgin Atlantic!). 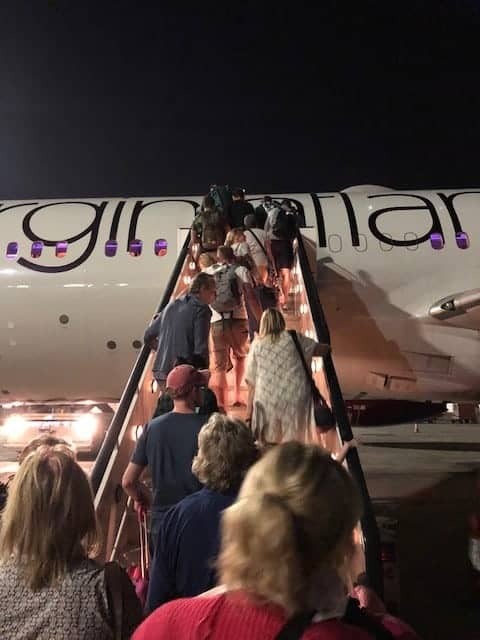 When boarding the Virgin Atlantic aircraft we were greeted by some of the most accommodating aircrew for an economy flight I’d had in a long time. I was sitting in seat 50K on board the Virgin Atlantic aircraft. The seat is 17.5 inches wide with a 31-inch pitch and a fully adjustable headrest. I’m relatively tall and I can’t tell you how frustrating it is when a headrest is positioned too low! The mood lighting makes photographs somewhat difficult although does create a great ambience within the cabin. Virgin Airlines Reviews L: There’s always a negative – With the ability to recline your seat comes the various problems with people behind. Frustratingly, the large screens (9 inches) in the back of the seats do not tilt. So when the person in front puts the seat back in Virgin Atlantic economy the screen can be difficult to view (at an angle). The only solution is to recline your seat also – or else you’ll struggle to watch the in-flight entertainment. One more moan, whilst the tray tables are large enough, they slant slightly into your lap. As such if you’re not careful you may end up with half your glass of wine on your lap! One cool point is that the windows can be dimmed by the press of a button. No pulling down blinds with Virgin Airways. These also appear to be controllable from a central console, which means that passengers aren’t woken up with requests by the cabin crew to raise the blinds. The Virgin Atlantic in-flight entertainment is strong. With the screen extending to 9 inches, it’s larger than most alternative options. There are various movies, TV shows, music, games and more. More includes the likes of destination guides, sky map, seat chat and a list of stretches you can do in-flight. 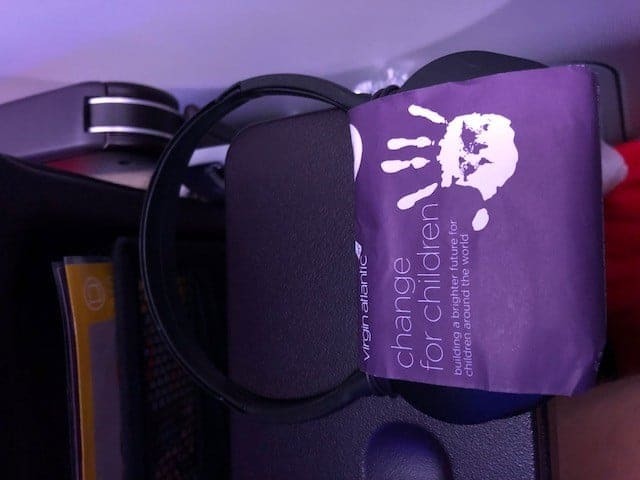 Headphones are free and are sturdier than most given away free on economy flights. Wi-Fi is available on board although it is expensive: 40MB for £4.99 or 150MB for £14.99, which would both be used up in no time whatsoever. With most airlines seeking to cut costs in every aspect of their operations, on board food can be somewhat dire. Fortunately the Virgin Atlantic In-flight meals are an exception. 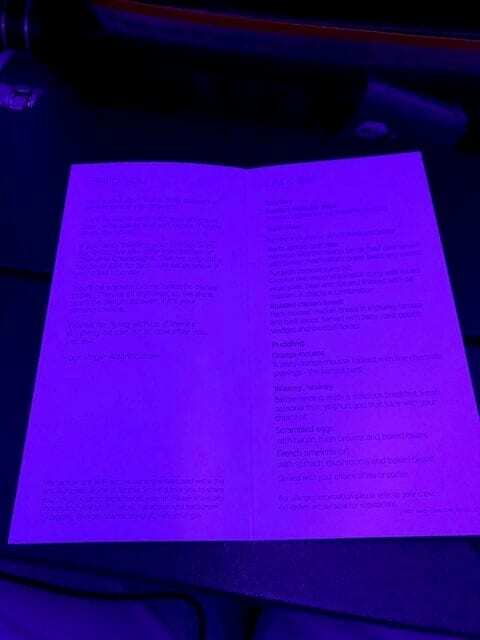 Sorry about the quality of the picture of the Virgin Atlantic food menu below. 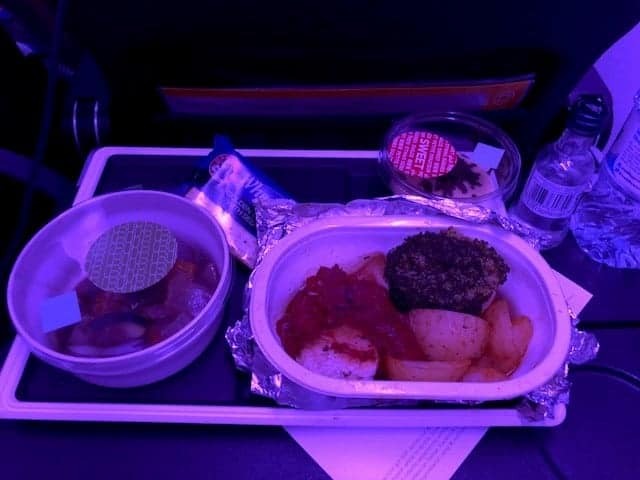 As this was a night flight we were offered dinner and breakfast as part of the Virgin Atlantic in-flight food choices. The Virgin Airlines food was fine. I went for roast chicken breast as I’d had my fair share of curries and stews throughout the holiday. For breakfast there was a choice of either scrambled eggs or French omelette. Quite an eggy selection and not great if you’re not a fan of eggs! One to think about for whoever creates the Virgin Atlantic economy food menu. Whilst I know I’m always going to wake up with a bad headache and crooked neck, I struggle to avoid getting involved in the vast selection of Virgin Atlantic free drinks. Choices mirror the likes of British Airways, with the Virgin Atlantic drinks menu including everything from a nice mini bottle of Merlot to Bloody Marys. Be careful though, make sure you keep the top on any bottle of wine, as mine slipped off the fold-down tray on a number of occasions. Now last but not least let’s focus on the customer service. I have to admit I don’t usually write economy reviews, however after the fantastic service I received from the cabin crew I wanted to show them the recognition they deserve! They were quite simply a step above any economy cabin crew I had experienced in a long time. Nothing felt like it was too much trouble for them and they made regular conversation with passengers throughout the cabin. Great job, team Virgin Atlantic! Arriving on time into Gatwick Airport concluded what was a thoroughly pleasant Virgin Atlantic economy flight. What did I learn? 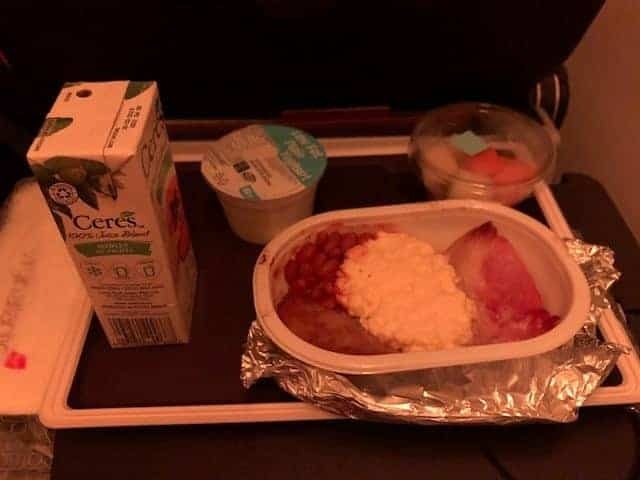 If you’re prepared to pay only a fraction more than a low-cost, long-haul provider, you’ll receive good service alongside perfectly acceptable food and drinks. Check here to explore the various Virgin Atlantic economy options where you can choose between the Light, Classic and Delight packages. As always we hope you’ve found this Virgin Atlantic review useful. If you wish to collect Virgin Atlantic reward points I’d strong recommend taking a look at the Virgin Atlantic credit card and American Express Gold Card (reviewed here). As I’ve mentioned, through clever spending on both cards you should be able to generate enough points for 2 people to fly to the Caribbean in Premium economy! seat 50K on most VS 787 equipment is designated for Economy Delight zone since March this year, the seat pitch should be 34 inchs now, and i think you would feel more uncomfortable if you were really had a 31 inchs seat pitch.